Southern Produce Distributors, Inc. a grower, packer and shipper of sweet potatoes, has installed a new packing line in their warehouse facility located in Faison, NC. 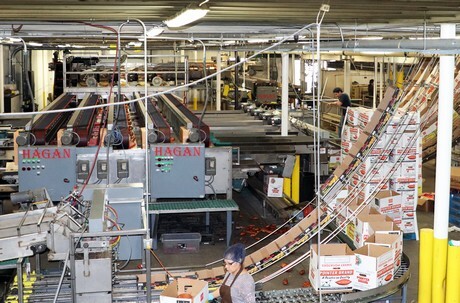 The new packing line, a Hagan 2, runs simultaneously with Southern Produce’s original packing line, doubling efficiency and minimizing operational costs. The Hagan 2 runs five lanes with a computerized “photohead” sizer that measures the dimensions of the sweet potatoes to ensure consistent shape and weight. Furthermore, it has a state-of-the-art box scale system, which allows for precise weight determination and real-time adjustability. Since becoming fully operational on January 1, 2018, the new packing line has been tested to its full capacity and to its lowest capacity with minimum to no issues.